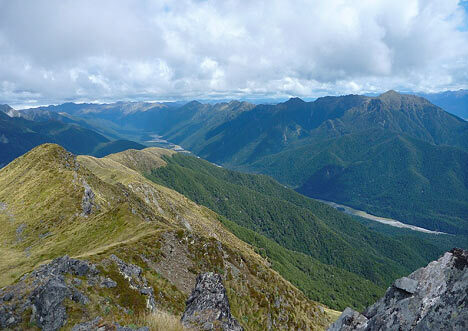 As a kiwi living in Brisbane one of the main things I miss about New Zealand is the mountains. Unfortunately nothing I’ve tried in Queensland and Northern New South Wales quite matches the rugged grandeur of the southern alps, so once a year I gather a small group of Australians, bring them across the Tasman and show them some real mountains. This year I had an urge to discover a route from Lake Daniell in the Lewis Pass to Lake Rotoroa in the Nelson Lakes National park. After many hours consulting Google, and switching back & forth between Google Earth & Freshmap I settled on a route that would take in Lake Daniell, The upper Glenroy river, Nardoo stream, Watsons creek and the Mole tops mostly by untracked but known routes over the three mountain ranges blocking our path. We flew into Christchurch airport arriving early Saturday morning allowing us a 5 hour snooze before driving into Bivouac to collect hut passes & gas canisters. 10.30 am saw us headed north with a quick stop at the Culverden bakery for one of their delicious pies, a great start to any tramp. 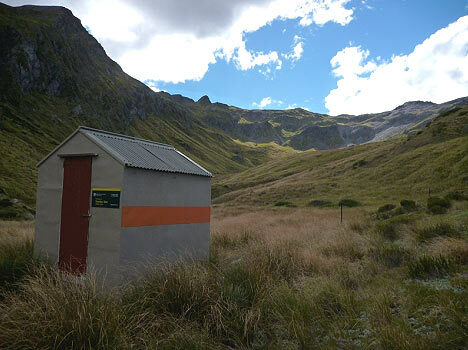 By 1.30pm, a mere 12.5hrs after arriving in Christchurch, we were on trail heading into the beautiful lewis pass wilderness. An easy 2.5hrs walk along good tracks with only limited storm damage at one side creek crossing saw us at Lake Daniell for an afternoon swim. I was a little apprehensive about stripping down to shorts in sandfly country but then you can’t let the Aussies have all the fun. 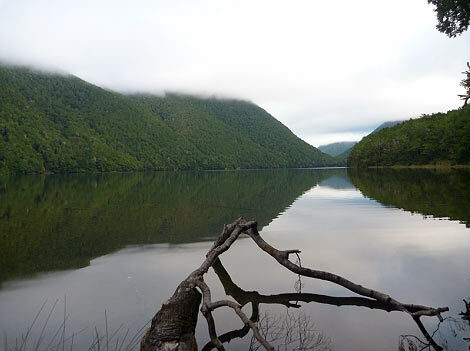 After our very refreshing dip we relocated our tents away from the developing teenage bash at the Manson-Nicholls Memorial hut to a very pleasant lake side camp site in the bush a few hundred metres further around the eastern side of the lake. The following morning we headed out passing the hut for lovely morning lake views before entering the bush immediately behind the hut to access the bush spur that would lead us to the tops. The bush travel proved to be a little untidy in places with regrowth & wind fall slowing our travel. The spur does however offer straight forward access to the tops and once clear of the bush we followed strong deer trails along the ridge lines. Tarns with a high tadpole population exist around 1300m where we had a pleasant lunch stop and it must be said no tadpoles were harmed. 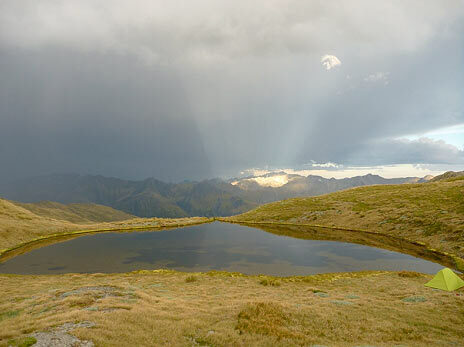 My original intention had been to camp at these tarns but having now seen them I’m glad that we stopped beside the beautiful Lake Daniell instead due to lumpy conditions in Tussock & Spaniard. 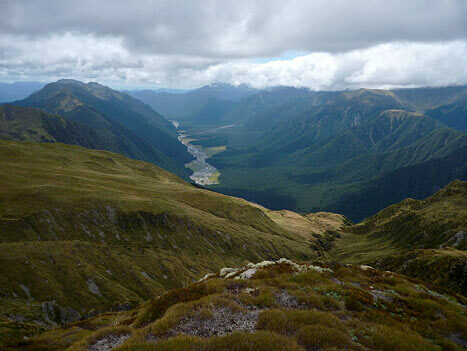 We continued along ridge lines on deer trails through mossy ground cover & snow grass for the afternoon taking in the views towards Reefton, back down to Lake Daniell and across to the Opera Range & Spenser mountains. The higher we got the better the views with the air so crystal clear mountains 5km away looked so close it seemed you could reach out & touch them. Our camp for the night was alongside a large tarn at 1680m on the Glenroy side of the range directly beneath point 1742 with fantastic views across the upper Glenroy to the Spenser range. This beautiful tarn presents a very picturesque fine weather campsite reasonably protected from southwest weather patterns. We were presented with a fantastic light show in the form of an electrical storm on the other side of the Glenroy that teased us somewhat when it started to rotate towards our camp. Thankfully it headed north missing us but leaving a parting gift of two rainbows and a dazzling light show as rays of sunlight illuminated the tops across from us. It seems good luck was again playing a part in our adventure as we watched the storm pass directly over where I had originally intended to camp 4km north of our vantage point. Our route again followed strong deer trails hugging the escarpment edge along the tops into dense cloud that obscured our views offering only the occasional glimpse down the nearly vertical western side of the range. We did feel we were walking along the edge of the world here as the easy slopes of the eastern side of the range contrasted sharply with the almost vertical western side which dropped 800m to the valley floor below. 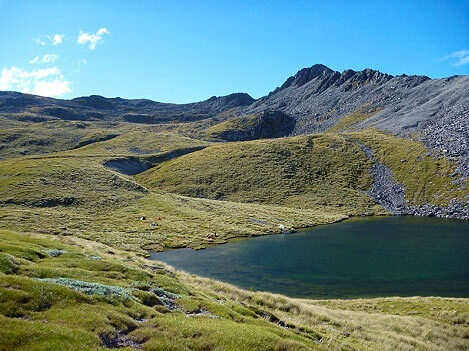 The travel was quite pleasant however along the flat top ridge with numerous tarns offering fine weather campsites, none quite as nice as our overnight spot though. The only real obstacle we encountered in this section was around point 1749 where very steep northern & western aspects with exposed faces and potential falls of several hundred metres forced us to descend an easterly ridge to a very steep unstable rock chute at around 1600m. We descended the rock chute to the basin below with several loud cries “who’s silly idea was this?” due to unstable rock dumping people onto their bottoms, and crossed the basin at around 1500m before climbing a north-easterly ridge to regain the ridge lines 50m beneath & north of point 1749. This detour added two hours of rough travel that had some interesting moments of trepidation in the rock chute. We did inspect a potential route off point 1749 on it’s northern face but it would take a better head for heights than to have a crack at it! 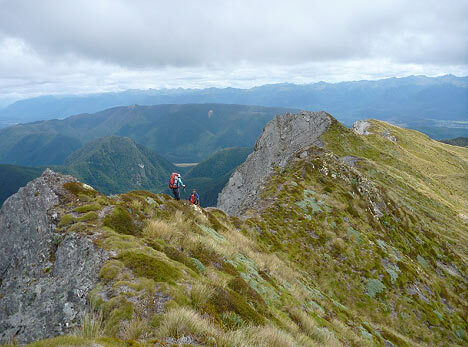 Having regained the ridge north of point 1749 we continued along the escarpment edge deer trails before descending to a low saddle and large tarn at the head of the Sheriff river and where the alpine fault crosses over into the Glenroy river. A rock cairn beneath the tarn leads to an old blazed route down into the true right branch of the creek below. We didn’t manage to find the blazed route and I’m told that its almost non-existent now so we found our own way by following the true right branch down. This proved to be the most challenging part of the trip with very steep bush descents, rough creek beds & numerous waterfalls. Travel became somewhat easier below 800m as we were able to follow the severely storm damaged creek bed out to our camp in the Glenroy from there. A very easy 13km down grass flats and in the Glenroy river to the confluence of the Pedro Creek & the Glenroy followed where we camped on a river terrace for the night anticipating a tough climb over to the Nardoo the next day. Our route up to Nardoo proved one of the most enjoyable parts of the trip with strong deer trails in the bush and on the tops making for easy travel. The views from atop the spur are beyond belief. It’s not often that one can photograph an entire mountain range in one image! Once on the spur strong deer trails were easily followed to the open tops above branch creek, the deer trails on the spur were superb leaving many DOC trails to shame – maybe trained deer would be the answer to DOC’s track maintenance woes! On reaching the head of the spur our route into the Nardoo consisted of sidling across a benched area to a prominent rock buttress on the northern side of the spur. A narrow pass led us to grass slopes threading between extensive bluffs into the Nardoo basin above the Nardoo Biv. The two bunk Biv provided a wonderfully cosy dinner spot for five out of the elements. Our expected track walk down Nardoo stream proved that one shouldn’t take maps for granted as from around the 700m contour no trail exists and a combination of off track travel & boulder bash is required to find a route to the track end. Good luck & attention to our GPS allowed us to pick up a good track that lead over a low spur to farm tracks in the Matakitaki valley. 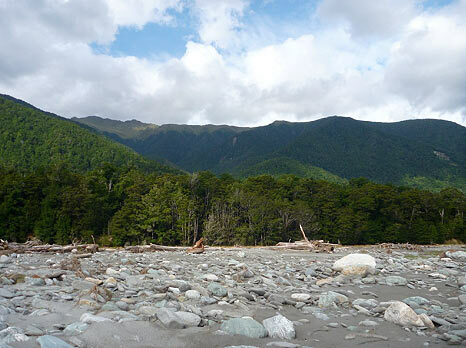 We were not keen on the extra 4km to cross a bridge across the Matakitaki so we forded opposite our intended camp at the vacant Matakitaki base hut site. Silly move as four of us took an unintended bath courtesy of strong flows! The Watsons creek route to the Mole tops is a spectacular tramping route that has mostly escaped the storm damage prevalent elsewhere in the Nelson lakes area. 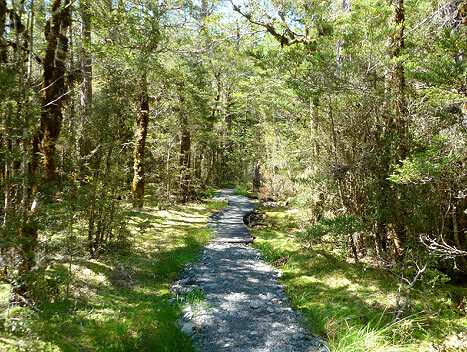 The good track ascends the stream bed crossing repeatedly to access open Tussock & Spaniard tops at around 1200m. We passed several very cosy campsites in the bush edge that would make for a pleasant overnight stop before battling Spaniard to gain easy boulder scree for the climb into the upper basin. Above the boulder scree a quick 50m climb on snow grass gained the saddle and presented us with a very picturesque fine weather campsite beside a large tarn on the D’Urville side of the saddle that proved a perfect spot for our last night in paradise and a very cold swim. 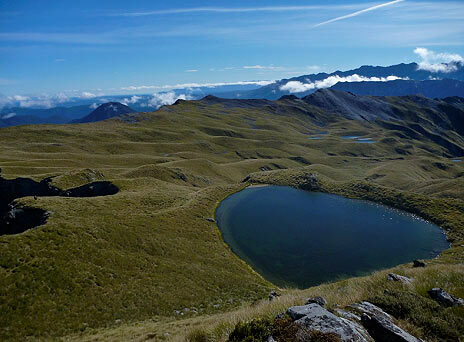 A short easy climb to cross a low saddle behind our camp provided access to the Mole tops basin where stunningly beautiful tarns competed with fantastic views down the lower Matakitaki as we followed easy ridgelines around to point 1651. 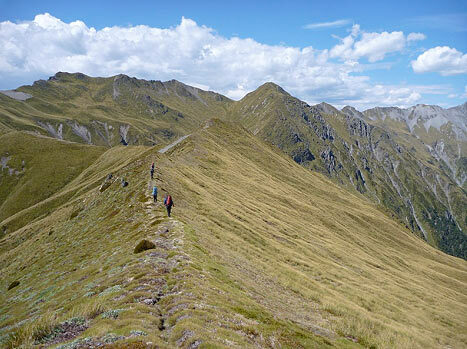 We had a choice of multiple routes into bull creek, ridgelines to Mole saddle being the obvious however we chose to descend a steep spur from point 1651 which provided a quick & easy descent to the stream bed below. The old permalat route down Bull creek is very patchy and we resorted to making our own way in bush & boulder bash for the majority of the descent to the D’Urville. Bull creek has suffered extensive storm damage & the travel is quite rough with numerous crossings & debris in the creek bed. 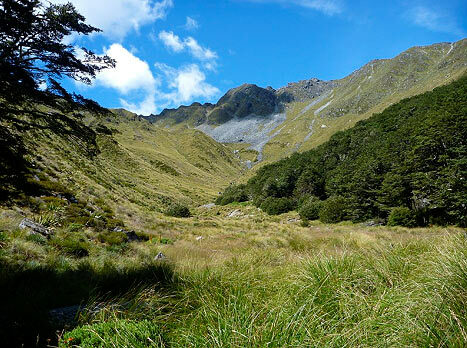 A more direct route might be to descend a northerly bush spur a few hundred metres west of point 1452 to meet Bull Creek near the 520m contour. We finally reached the D’Urville jetty at 6pm after a day that was considerably more challenging than expected with 3 sprained ankles & one dislocated finger in our party. The Rotoroa water taxi & Nelson Lakes shuttle service were a thankful sight after 8 days in the bush. This trip should only be attempted by experienced parties with sound navigation skills and a thorough knowledge of local conditions. The route as described involves mostly off track travel where opportunities for misdirection frequently present themselves. The route also involves several nights camped on the tops that in fine weather are superb but in foul weather would be exposed and unpleasant. The rewards, however for those fortunate enough to be able to gain access to the area are beyond words, An incredibly spectacular and dramatic landscape that cannot fail to awe & inspire. I would like to thank my companions, Philippa, Sonja, Paul & Lindon for their fine company & fortitude in our adventure.